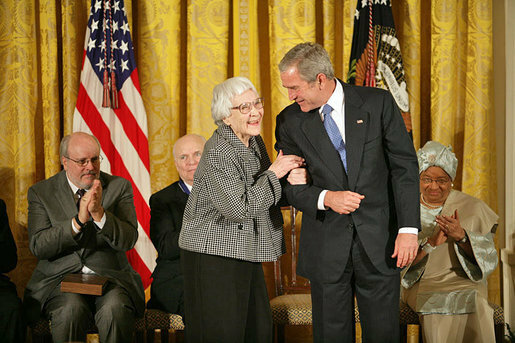 I was surprised and saddened to see on Facebook this morning that Harper Lee had died today at the age of 89. Her culture-shaping and enlightening novel, To Kill a Mockingbird, enthralled and enlightened me as a sophomore in high school and has maintained its status as my favorite book of all time. I have since purchased her recently released Go Set a Watchman, but have not managed to carve time into my schedule to enjoy the novel. As we mourn the loss of a literary titan, take a peek at this resources for learning more about her, and teaching your students about her legacy. The woman who wrote one of the 20th Century’s culture-changing novels is gone. Peering back across Harper Lee’s life, it can seem impossible to distinguish the novelist from her masterpiece, To Kill a Mockingbird. Lee died at the age of 89 in her hometown of Monroeville, Ala., on Friday morning – yet it’s clear that her legacy will live on much longer than that, through her characters and the readers who have embraced them for decades. Scout, Atticus, Boo … To Kill a Mockingbird’s characters are forever ingrained in millions of readers’ minds. Harper Lee, whose 1961 novel To Kill a Mockingbird became the defining text on the racial troubles of the American deep south, has died this Friday at 89. Harper Lee’s career was marked by some astounding numbers. Here are some of them, according to the archives of her former literary agents at Columbia University. Advance for “To Kill a Mockingbird,” sold to publisher J.B. If you know of any additional resources, please share them in the comments below. Thanks, Michelle- very useful and easy to access all in one spot. Many thanks for your ongoing support!